Left: This logo is being retired. Right: This older logo is the temporary replacement. A complaint by the Freedom From Religion Foundation over inclusion of a chapel with a cross atop it on the new seal for Steubenville, Ohio, has resulted in a victory. 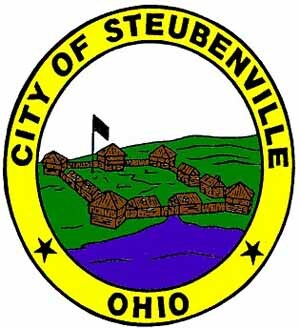 The city of Steubenville law director emailed FFRF this morning to report, “the city council has agreed to change the logo as per your request.” For now they are reverting to their previous city logo, until a new design is completed. The disputed silhouette depicted the chapel of Franciscan University, which even Franciscan University spokesperson Tom Sofio told media is “instantly recognizable worldwide.” A different, nonreligious image of a different building from the University will be substituted. FFRF Staff Attorney Patrick Elliott wrote Mayor Domenick Mucci on May 22, pointing out the city logo containing a Latin cross violates the Constitution. FFRF, with nearly 19,000 members nationwide, wrote on behalf of a Steubenville complainant. FFRF has members in Steubenville and nearly 500 in Ohio. “We’re pleased with the expeditious response,” said FFRF Co-President Annie Laurie Gaylor. Please write and thank Steubenville city officials for honoring the Constitution. We also encourage you to cast a “yes” vote in the Herald Star's poll: Do you agree with the city's decision to redesign its logo?